Client Projects | Island of Doom Software Inc.
Garden Gnomes is a client project that Island of Doom has been working on with Lost Lamppost, LLC. It’s a whimsical strategy game, with playful and bright graphics. Island of Doom contributed the graphic art as well as design advice. The game is now available on the App Store for free! 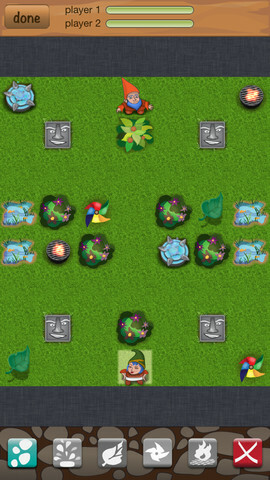 In Garden Gnomes you get to choose your gnome, along with colour options, and then you get to enter the garden to battle your enemy gnome. You can play a match through Game Center or you can play locally with a friend. The garden offers many fun surprises, so I encourage people to experiment with their magical gnome powers. The company was started in 2012 by Jay Haase and Adam Rademacher. Jay is an IT Consultant and returned Peace Corps volunteer with experience creating IT solutions for organizations in developing countries. Adam is an avid gamer with a “strange imagination.” He currently works in the banking industry. Together they have made a dynamic team and a pretty fun game.